Russia and China’s veto of the UN Security Council resolution which condemned Syria over its brutal crackdown on anti-government protesters and contained a weak reference to the possibility of sanctions against Damascus proved (again) one thing – that despite torrents of soaring rhetoric to the contrary by our leaders, international politics is not about doing what is right and in the best interests of all nations and peoples, it’s only about the short-term, short-sighted, political self-interest of leaders and their governments. And the statement by U.S. ambassador Susan Rice, described by the New York Times as “one of her most bellicose speeches in the Council chamber”, was pure, unadultered hypocrisy at its most naked. If I was contributing to the updating of dictionaries, I would add another definition of hypocrisy – American foreign policy. This is, of course, the same Susan Rice who will cast the U.S. veto to kill the Palestinians’ bid for Security Council recognition of their statehood (if the bid gets to the Security Council). It is apparently of no concern to her and her master that the Security Council has utterly failed, time and time again, to address the criminal policies of the Zionist (not Jewish) state of Israel, policies which present a far more urgent moral challenge and growing threat to regional peace and security than what Bashar al-Assad’s monster regime is doing in Syria. Quite so, madam ambassador, but is it of no concern to you that almost the whole world (of peoples not governments) is aware of who on the Security Council supports the Palestinian yearning for liberty and universal human rights and who does not? If there was a Nobel prize for hypocrisy, Susan Rice would have to be added to the list of nominees for it along with President Obama and Israeli Prime Minister Netanyahu. (Question: What do those two gentlemen have in common? Answer: In the context of targeted assassinations, it can be said that both are cold-blooded killers). On another matter… The jury in my mind is still out on the question of whether or not professor Shlomo Avineri, the Polish-born Israeli political scientist, is a hypocrite. His most recent article is in Ha’aretz with the headline No realistic chance of permanent Middle East peace. The following is its opening paragraph. In theory that makes a lot of sense, but it ignores the fact that most Israeli Jews have been brainwashed by Zionist propaganda and, as a consequence, need to feel threatened, need to believe they are the victims and not the oppressors. Put another way, most Israeli Jews do not want to believe that the Palestinians (the vast majority of them) have long been ready for peace on terms which any rational government and people in Israel would have accepted with relief. That being so, there isn’t a snowball’s chance in hell of peace unless and until an American president has the freedom and the courage to use his leverage to compel Israel to end its occupation of all Arab land grabbed in 1967. Great post written with feeling and insight. 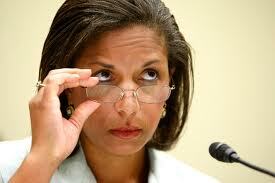 Susan Rice is a nasty piece of work who plays the game for the US Empire more fiercely than most of her peers. US Ambassadors to the UN in recent times have not been of good pedigree. John Bolton, her predecessor and ardent Christian Zionist was equally as duplicitous in his dealings at the UN. Personally, however, I do sympathise with the Russians and Chinese in their veto. After abstaining on UN Libyan resolution 1973 (mainly due to US rhetoric that vetos signalled a go ahead for another 'Rwanda' - funny how the US was happy to let Rwanda continue and yet is vigilant when an oil rich country is involved), perhaps this time they were concerned that another Libyan situation should not be set in motion by this and then subsequent harder UN resolutions. The situation in Syria is ambarrassing for israel and its western "stateguards": Assad is an ally of Iran and the demonstrators are mostly moslem brothers ie: Hamas. It's for zionists like sailing between the devil and a deep blue sea! It's why Russia and China both dared to challenge by there vetos. The Wikipedia has been taken over by the defenders of Israel and they're busy writing their lies into the historical record. One of the big advantages that they've got is that, by picking holes in every change from editors who are not on their side, they make it impossible for others to work articles into something better. Do you know of any alternative software platform to write articles on, say, the settlements? Articles that would reflect what's actually in the media and books like your own? ie not quote the MFA or Israeli Ambassadors or Susan Rice as if they were fountains of wisdom! The israelis have made themselves irrelevant. Peace is coming because the israelis will have no say in their future. Thank you very much, Mr. Hart, for being a voice for rectitude. I abandoned all hope for an honest Wikipedia entry about myself a very long time ago. Initially a friend of mine (an award winning BBC radio producer) wrote and input to Wikipedia an honest summary of my experience as an ITN and BBC Panorama foreign correspondent who covered wars and conflicts wherever they were taking place in the world. The summary noted that I enjoyed intimate access to, and on the human level friendship with, leaders of BOTH sides of the many conflicts I covered, including and especially what used to be called the Arab-Israeli conflict. The summary also quoted me as saying that I am probably the only person on Planet Earth who enjoyed intimate access to, and on the human level friendship with, arguably the two greatest opposites in all of human history - Golda Meir, Mother Israel and Yasser Arafat, Father Palestine. The original honest text was not allowed to stand. Supporters of Israel right or wrong (they may or may not have been Mossad agents or assets) deleted almost all of the original honest text and substituted garbage. Several attempts were made to restore the original honest text but each time it was trashed. The truth about me and my experience was suppressed and I was wickedly misrepresented, more by omission than commission. My computer engineer eventually tracked two locations from which the dirty work on my Wikipedia entry was being done. One was in America, the other was in Australia. I do, of course, understand why Zionism puts so much effort into suppressing not only the truth of history but the truth about those who seek to tell it. Truth is the weapon that will eventually defeat Zionism. (That ought to be good news but it might not be. As I quote Prime Minister Golda Meir telling me in a BBC Panorama interview, in a doomsday situation, Israel would be prepared to take the region and the world down with it). William, I am not understanding what you mean by “alternative software platforms”. All I can say is that there are a good and increasing number of web sites that do provide various elements of the truth. Mr Hart you can detail the hypocrisy and evilness of the states of Israel and the USA and very few people of sound and decent mind would disagree with you . but as always the saying " Evil will triumph when good people do nothing " and we who take the trouble to watch and comment know this to be true . and yet we are virtually helpless in the avalanche of lies and hypocrisy that is coming out of our governments and the UN . 90% of the people in Australia would want the Palestinians to have their own state . but our government abstains on the vote to give that to them . We have a poisonous red head for Prime Minister . who is always smiling when she lies and 60 to 70 % of Australians know this . so one asks who does she serve . us or the Axis nations of US /Israel and the UK . a question that goes without asking . because we all know the answer . Voting this scum out of office makes no difference . because the next mob are exactly the same . Take the example of the UK and USA and you have the answer . evilness and hypocrisy!! Wikispooks is a volunteer project that is endeavoring to address the extreme Zionist (among other) biases of Wikipedia in a positive way. We recently posted a Wikipedia-like article on Alan and would welcome assistance with polishing it, together with any relevant article creation input too. In other words, Wikispooks is a credible home for the exposure and correction of clearly biased Wikipedia articles. Feel free to contribute. when you are a thief you are always afraid of losing what you steal..that is why israel has brainwashed its citizens into a state of continuous fear and panic...there is also so much hate,although i would assume the opposite but the palestinians have been subjected to so much injustice ..it will take another life time to rectify...israel has to withdraw to the 1967 lines if it hopes to continue its presence in the me...it has to learn to live with others and accept its neighbors as equal...this so-called democracy has proved to be false! I was pleased to see that the Iranian spokesman in the UN gave a spirited response pointing out Susan Rice's hypocrisy, whereupon she flounced out. As for wikipedia, I am very wary of using it as I knew about the Zionist teams making it their business to "improve" items they disapprove of. Wikispooks sounds better!